There is a lot that has happened over the last few week, but as usually happens during the winter, I have become lapse in recording it. I mainly write so that family can track me as I travel during the summer. Winters in Arizona are repeatedly consumed by parking in the desert, or spent with family doing a lot of things they know about, so I fall into a routine of quiet documentation. After I arrived in Why, AZ, I received several invites to return to Phoenix for niece Michelle’s graduation from Devry University. It turned out to be a nice trip back to town. Along with getting to attend Michelle’s graduation, I had a wonderful time visiting with family for a few days. I also found a new Doctor and established with him through my Cigna Advantage Plan. I parked at Daryl’s house for a few days while I saw my new doctor and then camped at Bulldog Canyon for a week for the graduation and many meals with family. My Canyon camp was only five miles from the RV park where Richard and Dianna were staying so I would ride my motorcycle to their home and travel with them to all the activities. In the evening Richard, Dianna and I would walk over to the hot tub after dinner and relax in the hot water. It was a nice time spent with all. After the side trip to Phoenix, I went back out to the LTVA near Yuma. 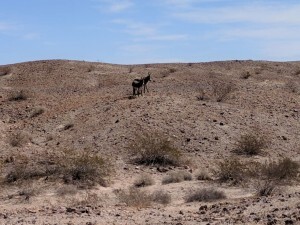 Within a few days, Richard and Dianna joined me at my site here in the desert. We positioned our rigs so that we are isolated on a little hill, forming a courtyard of sorts, and optimizing our direction for the most sunshine on our solar panels. We have been quite busy the last two weeks. It seems like most days we go somewhere. We have done lots of geocaching, finding over 20 hides in the area. It is a good way to get some exercise without realizing it. Twice we have been to Los Algodones for dental work. The first trip I had a tooth pulled and Richard had a root canal. Neither of us felt much like eating afterwords so we stood in the long line to get back across the border. The second appointment was not as destructive to our teeth, so instead of waiting in the long line to cross the border, we had a nice meal of Mexican food at the local open-air plaza. By the time we were done eating the lines to cross back into the US were minimal. Yesterday, we drove to Picacho State Park, situated along the Colorado River about 25 miles from anything familiar to civilization. The road was dusty, sandy, narrow, and rough, but R&D’s Subaru took the terrain like a champ. It was actually a nice campground with over 50 sites scattered in the foothills along the Colorado. There was a self-pay stand asking for $10 per car when we drove in. All Richard and I had were $20’s so we became outlaws and skipped the entrance fee. The place was pretty deserted with only three or four campers hiding from us as we drove around. We drove down to the boat launch area and read about paddle wheelers coming up the river many years ago. Picachos population reached 2500 residents back in the 1860’s as gold was mined along the drainage hills by the river. We hiked a trail back to the remains of an old stamp mill and read signs about the old, rusting metal and eroding structures along the way. It was a fun day of hiking and learning about early life along the Colorado River. We have two more weeks planned to be here at the LTVA and then we will return to Phoenix. Richard and Dianna have some work planned on their rig before they go up on the Rim to work for the forest service this summer. I have a follow-up Dr appointment and then will move with the weather. We have had lots of nice cool temperature days here in Yuma but it is way too early to move far north just yet. Is Picacho State Park different from Picacho Peak State Park? I guess that’s a silly question since you mention being along the Colorado. We have definitely been enjoying going hither, thither & yon with you. Lots of fun times!! Richard was doing some research on the state park and found out that there is also a Picacho Peak in California. Must have been a popular name back then. The word picacho means peak in Spanish. Therefore Picacho Peak is Peak Peak. Great summary. I know Michelle was thrilled to have everyone at her graduation. It was great to see you again. I always look forward to updates on everyone’s blogs. My blog reader doesn’t update for a couple of days, so I am frequently surprised to find a new post with several comments already on it when I get the notice. Glad you updated (or documented, as you call it), because you have been busy! Glad you’ve gotten to spend enjoyable time with R&D. Maybe you and I can hang out some later this summer. I plan to stalk you in NM in July/August if you’re still there.